"This is a recipe I love to make when having a Mexican fiesta. It is basically a dip. It can also be used as a filling for tacos and burritos." 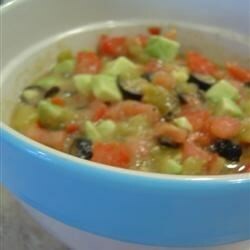 In a medium bowl combine avocados, tomatoes, olives and chilies. Stir until ingredients are well mixed. Squeeze lemon juice over the mixture, and sprinkle with salt and pepper to taste. Delicious and nutritious snack dip! I used this as 1 layer in a 7 layer taco dip & was able to combine 4 layers into 1 (not that it mattered). I added garlic, & a bit of cayenne. This is just your basic (diced) guac with olives. I have all the ingredients, and intend to make it for State Fair competition! Refreshing any time of the year. Great with tortilla chips! ENJOY!! Avocado Delight, don't you mean guacamole? This was good, but at least call it what it is! I made this dip awhile ago and fell in LOVE!!! I can't even recall how many times i've made it since! One thing....I use lemon juice to taste, and its just as awesome!! !